The four clubs in this group that went to the Major League playoffs in 2010 also composed the top half of the Second Division standings. In the end, the World Series, a 4-1 victory for the San Francisco Giants over the Texas Rangers, earned the Giants a First Division promotion for 2011 and denied that advance to the Rangers. As the eight clubs going to the 2009 playoffs were assigned to the First Division for 2010, this Second Division group that didn't make the 2009 playoffs might have been ticketed for greater things to come. In fact, four of these clubs — the Atlanta Braves, San Francisco Giants, Tampa Bay Rays and Texas Rangers — reached the Major League playoffs. The Giants and Rangers went to the World Series, with the Giants winning. Riding a 7-2 playoff record against Second Division clubs, the Giants were the clear Second Division winner, and that playoff run did it. 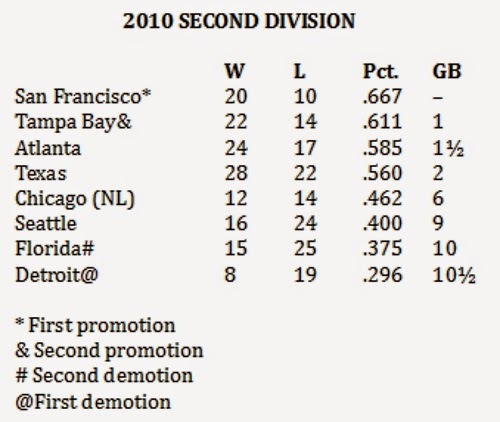 In the end, the Rays, Braves and Rangers all finished within two games of the Giants, but there's only room to promote the Giants and Rays to the First Division for 2011. The Seattle Mariners, whose 61-101 regular season record was the worst in the Major Leagues, barely escaped relegation. The two relegants for 2011 are the Florida Marlins (80-82) and the Detroit Tigers (81-81). The Tigers are instructive about how a season looks different when we consider only certain opponents. They only played against Atlanta, Seattle, Tampa Bay and Texas within the Second Division, finishing 8-19. Which means they were 73-62 against all other clubs, which doesn't really matter here.